ALTERNATE visions for the renovation of Preston's Harris Museum, Art Gallery and Library created by student architects have gone display in the building. 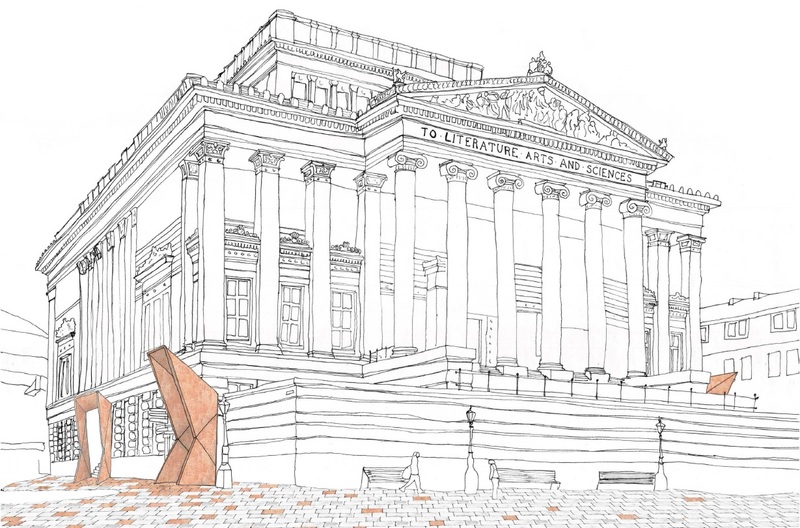 The drawings were produced in response to an early design idea unveiled in October that attracted controversy not least because a new entrance is proposed to be created under the podium at the front of the Neo Classical edifice. An application has been submitted to the Heritage Lottery Fund for money for the proposed revamp of the attraction in the city's Market Square being jointly led by Preston City Council and Lancashire County Council. The alternate designs are the work of members of Continuity in Architecture, one of the ateliers housed within the Manchester School of Architecture - jointly run by Manchester Metropolitan University and the University of Manchester - and staffed by postgraduates studying for their two-year Master of Architecture qualification. Imagery of their proposals are on show at the Harris alongside design ideas from University of Central Lancashire students. “One problem has been the diminishing use of the building and a consultation demonstrated that many local people found the Harris physically and emotionally intimidating. "The feedback indicated that some felt that in its current state the building is not fit for the 21st Century. “One of the important things is that there’s a huge podium. Yes, it’s a little bit brutal and is a little bit intimidating and things have to change but you don’t have to wreck the building to integrate that change. Ms Stone approached the museum’s Re-imagining the Harris Project Leader, Jon Finch, who agreed to welcome the students for a one-day tour to facilitate the conception of their own schemes. Mr Finch said: "We are at an early stage of our design development and we are actively encouraging input and feedback on all aspects of the proposal. "The input from Continuity in Architecture and from undergraduate architecture students from the School of Art, Design and Fashion at the University of Central Lancashire provide some very useful food for thought." The 2D perspective designs were created by three groups of five students each from the Manchester School of Architecture and will be on display as part of an exhibition called ‘Continuity in Architecture: Re-imagining The Harris’. Ms Stone said: “The Harris is very pleased with the range of ideas presented from Continuity in Architecture and elsewhere. .
“What the students are doing is using their knowledge and quality and the talents they have to influence our public urban areas. “It’s not so much working against the proposal of Manchester-based architects Purcell Architects but our students’ designs are sympathetic to the building and wouldn’t damage it. “Everything they designed would be removable and the building could be returned to its original state. The alternate designs for the Harris are just the latest example of projects undertaken by the Manchester School of Architecture, which was recently named the sixth best architecture school in the world, beating the likes of Harvard University and the University of Cambridge in the QS World University Rankings by Subject 2017.